After I posted in July about the feed sacks available in the 1950s (and maybe the ’40s?) from Barbara and Henry Wickre’s Climax Feed and Grain in Rolfe, Iowa, I was pleasantly surprised to receive more information from Loel Diggs about those sacks. Loel emailed to me the following information about the sacks mentioned by Sharon (Wickre) Rickard in previous posts. His initial information prompted my reply of several questions which resulted in his also telling me about his pickup. Our email conversations and photos supplied by Loel went as follows. Loel: I liked your last posting on the Climax Feed & Grain. When in high school (and Dad had bought the pickup) I would take our corn and oats to the mill, have it mixed and ground with feed concentrate, sacked and taken back to the farm and used to feed the flock of laying hens being raised. By the time we had the pickup , the imprinted feed sacks had pretty much disappeared and the concentrate or feed additives were being supplied in paper bags. However, the accumulation of prior cloth feed sacks, from the farm, were the feed sacks that were filled with the mixed and ground feed that I hauled back to the farm. Loel: I do remember the imprinted feed sacks. Those were the sacks that Mom and my sister would make into dresses, aprons and other stuff. The imprinted concentrate feed sacks, as Sharon states, were delivered to the farm with their delivery truck or would be brought home by my folks. Then the grinding and mixing of the chicken and other needed ground livestock feed was done on the farm. It was ground with a tractor-belt-driven stationary hammer mill that was hand fed with a scoop shovel. Loel: If Mother or my sister liked the imprint on the sacks, the imprinted sack only saw the original fill of concentrate feed. Some of the non-imprinted sacks would be made into dish towels, or used over and over again to contain the prepared feed that would be brought back to the farm to be fed. I always enjoyed taking the grain to town (to get it mixed and ground) because it allowed me a chance to get off the farm for a couple of hours during the day. This next set of emailed Q. and A. is in response to Loel’s first comments (those immediately above). Louise: Are the imprinted sacks the ones that had the stripes and other designs on them that Sharon talked about in her first and second audio recording segments? And, the non-imprinted ones just plain? Loel: Yes. The imprinted sacks were the ones that had all different designs as imprinted fabric does today. The non-imprinted sacks were just plain sacks with no identification on the sacks other than an identification tag sewn into the stitches to close the sack. Some feed sacks would come with a brand name imprinted on the fabric (such as FELCO Feeds). If Mom was going to use these, she would first bleach the sacks until the imprint would disappear off the fabric before being made into dish towels. 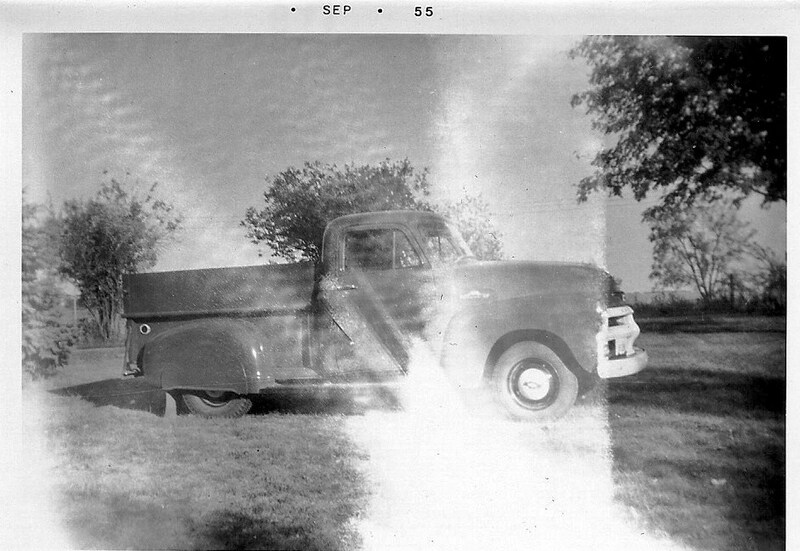 Later this week I’ll post Part II of Loel’s and my communication in regard to Climax Feed and Grain and also about Loel’s 1955 Chevy pickup. This entry was posted on August 31, 2010 at 2:18 pm and is filed under Iowa, Rolfe. You can follow any responses to this entry through the RSS 2.0 feed. You can skip to the end and leave a response. Pinging is currently not allowed. I really enjoyed reading the conversation with Loel and the information about the feed sacks.